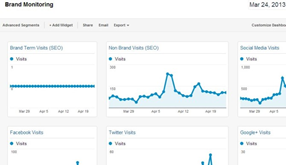 Google Analytics dashboards are terrific resources that bring together a wealth of data and information to help you see the big picture and make improvements in very specific ways. While they may sound overly technical, Google Analytics dashboards are simply groups of widgets you create yourself or import from other sites and then customize or tweak for your own purposes. For those who are just getting started, I always recommend importing or downloading pre-designed templates that can be adapted to your particular business objectives and goals. Later, with a bit of experience under your belt, you can begin to design and build your own dashboards. Referral websites excluding major sites such as Facebook, Google, Twitter, etc. Remember, although these dashboards are comprehensive and informative, you’ll probably need to give them your personal touch by tailoring them to your brand’s specific needs. You may need to add different widgets and remove ones that you don’t need. Your ultimate goal should be to develop your own customized Google Analytics dashboards that reflect your own key performance indicators. 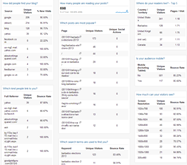 As with many things in digital marketing, creating your own dashboards will be a process of trial and error. But once they’re in place, you’ll quickly realize the time spent tweaking and tuning was more than worth the effort. 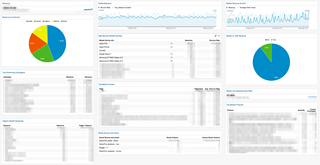 Do you have your own favorite Google Analytics dashboards? 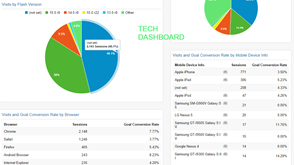 Have you mastered the art of customizing your own dashboards? I’d love to hear about it – why not share your comments below?